National Voter Registration Day: The holiday Republicans want you to forget. The one national holiday Republicans want you to forget. People line up to cast their ballots in Washington, D.C. on Nov. 6, 2012—a sight that some people seem to appreciate more than others. As holidays go, National Voter Registration Day is self-explanatory. Created in 2012 by the League of Women Voters, it’s a day in September when volunteers work to register voters and increase participation. In the last two years, the effort helped add 350,000 people to the voter rolls, and this year more than 2,000 groups have organized events to mark the occasion and repeat the success. In Atlanta, for example, the NAACP, the Georgia Coalition for the People’s Agenda, the Georgia Association of Latino Elected Officials, and the American Legal Advocacy Center of Georgia gathered at the State Capitol to host a mass registration event. Likewise, in Ohio, the state Democratic Party held registration events in Cincinnati and Columbus, by way of a statewide bus tour. And on a more national note, the Democratic National Committee issued a message in support of National Voter Registration Day. The Republican Party has not responded with similar enthusiasm. Nearly two years after it pledged more outreach to traditionally Democratic communities, the Republican Party remains committed to a strategy of voter suppression. 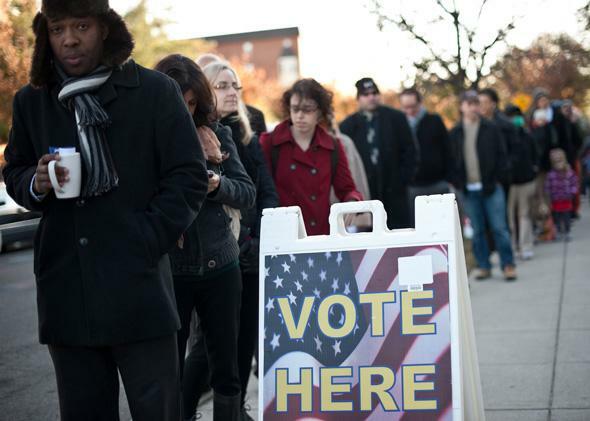 Voter identification laws in North Carolina and Texas have kept thousands of people from the polls, while some Ohio Republicans are charging through judicial setbacks to pass a new voter ID law and maintain attempted cuts to early voting. And in Wisconsin this month, a panel of Republican judges on the 7th Circuit overturned an injunction against the state’s voter ID law, which was criticized for its burden on low-income and minority voters. “Unfortunately,” wrote DNC Chairwoman Rep. Debbie Wasserman Schultz on her organization’s website, “Republicans have made the cynical calculation that their path to victory is a smaller electorate. Obstacles to registering to vote—such as elimination of same-day registration and refusal to adopt online registration—disproportionately affect young people, women, and communities of color.” Wasserman Schultz’s statement is typically partisan, but it’s not wrong. Beyond voter ID, there’s been a raft of GOP efforts to blunt voter registration efforts. The frenzy that began with ACORN in 2009—in which Congress pulled the group’s federal funding after misleading videos of alleged misbehavior and false cries of voter fraud—has extended to state capitols across the country. Most have been challenged in court, and some—like a Florida law that reduced the time for returning registration forms and levied stiff fines for missing the deadline—were blocked entirely. What’s striking, however, are the lengths officials have gone to burden groups that register voters. To use one instance, Republican lawmakers in Kansas, Georgia, Alabama, and Arizona have passed “proof of citizenship” laws for state voter registration—burdening low-income and elderly voters without birth certificates. In 2011, Texas Republicans took the unusual step of creating a mandatory official volunteer system for anyone who wants to run a voter registration drive. The rules for inclusion are among the strictest in the nation: Non-Texans are barred from participating; anyone registering voters most undergo training through a specific county; approved registrars can only register voters in the county they were approved; and all registration forms must be personally delivered to officials. Failing to deliver forms within five days, says the law, is a criminal offense. When it comes to voter engagement and participation, the most you can say of Republicans is they’ve thought of their own supporters. It’s why—to mark National Voter Registration Day—they announced a “get out the vote” tool for GOP voters, called Vote GOP. In fairness, it acts as a general tool for anyone who wants to know the details for voting in their state. Still, when considered alongside GOP efforts against registration, it gives an ugly message: Sure, Republicans are happy to help other Republicans vote. Otherwise, you can expect roadblocks.